Hair fall is becoming a more common issue these days. I recently wrote a post on the same topic; but I just scratched the surface. I discussed a few important, very basic and easy to implement DIY remedies to prevent hair fall; but as I said those tips are not always enough and the hair fall issue is something that is wide spread and vigorous! So in this post I am going to give you a lot more natural remedies/tips that will help stop hair fall naturally, for good. Shall we start? No don’t be disappointed! But you know what – what you eat shows up on your hair. Well, not literally, but this is true. Iron is absolutely essential for hair growth. Taking iron-rich foods regularly will help the hair become strong and healthy and hence stopping hair fall. I make sure I eat dates and spinach regularly. If not more, massage your hair at least once or twice a week. I do it every other day but it is up to you (you know, there are time factors, convenience factors, the hair type and many other things that come into play). If there’s something that bothers you, massage your hair at least once a week (preferably during the weekends when you can be more relaxed). You can choose to use any light oil – I prefer coconut oil and olive oil (just any one at a time). Generously apply oil to your scalp by rubbing the oil to your palms and then applying it to your scalp. Once you’ve applied enough oil, use your finger tips (not your nails) to massage your scalp in circular motions. Do this for at least 10 mins up to 20 minutes. If you are bored or if you find it uncomfortable to do it yourself, ask your partner (this will be fun I promise) or someone else to do the massage for you. Massaging your hair increases blood circulation and helps preventing hair fall! Read more about hot oil massage in this post. Oh ya! If you eat a well balanced diet, you can more easily get your doses of hair-healthy vitamins and minerals. Mainly, Vitamin E, Vitamin C, Vitamin B, Biotin (Vitamin H) and Vitamin A.
Vitamin E nourishes the hair and helps prevent breakage. So even though it doesn’t help preventing the hair falling from its roots it can still help with hair loss due to breakage. And yes it nourishes the hair which means it helps growing healthy hair. Vitamin C is required so that the E is used up properly. Let me talk a bit more about Biotin. Biotin is a vitamin that arrests hair fall and promotes hair growth. It is easy to get your daily dose of Biotin with the regular foods you eat – it is hard to run into the case of Biotin deficiency. However, if you are experiencing serious hair fall issues, you should go for Biotin supplements. 5000 mcg of Biotin a day is considered a safe dose (and its a water-soluble vitamin – so your body will flush out the extras if you drink enough water). I can go on writing about Biotin and its benefits; but let’s keep that for another post. However I can say that I’m taking Biotin supplement for about a month now and I can see the results very obviously. My hair fall is arrested totally and the hair is growing too! I can also see lots of new hair starting to grow from my scalp as well. Its not even a month since I started taking the supplement. But be aware though, that there are a few side effects of Biotin (when taken as supplement) – acne, headache, bacterial yeast infection and so on. Also pregnant women should consult their doctor before taking this supplement. However I have had no side effects so far! Oh and by the way, Biotin is available in foods such as carrots, almond (and other nuts), milk, eggs and berries. In order to cover yourself with the supply of all the other vitamins I mentioned above, you can go for a multi-vitamin supplement. Pure Aloe Vera gel applied on scalp does a lot of wonders; one among those is to stop hair fall, naturally, of course! I have 2 plants in my garden and I don’t worry about getting the fresh gel whenever I want. 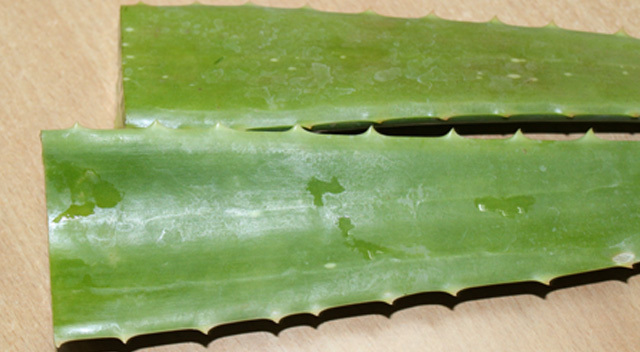 Simply go for one medium-sized leaf of Aloe Vera, extract the gel that lies between the outer thick layer (mind the small thorns at the edge). It should be well, jelly. Just apply the gel on your scalp and do a brief massage. Also do apply it on your hair to have a super-duper conditioning effect. When used at least once a week, Aloe Vera will suppress hair fall to a greater extent. Oh well, here’s something I use to have healthy long black hair. I’ve had no hair fall issues until just after I delivered my boy. The post pregnancy effect was that I started losing a lot of hair. And that’s why I had to go for Biotin supplements. But until then (and now) I’ve had no hair fall issues in my life, ever! So here are two things I do – the ingredients are pretty much the same. 5. (Optional) Fenugreek seeds soaked or immersed in Aloe Vera gel and both dried together. 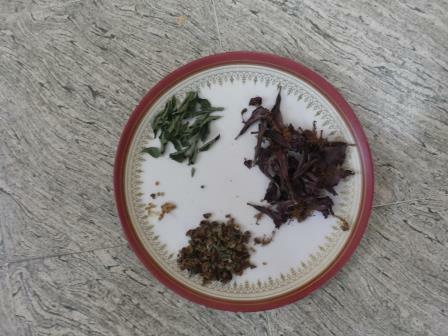 Shown above are the dried ingredients. These are the left overs after I’ve used some for my Remedy 1 (below) – so the Aloe vera gel + Fenugreek seed combination is very little. All the ingredients dried in shade. Oh no, except the one that’s not on the plate – That’s my son! All the dried ingredients should be dried in shade or mild sunlight (early morning and late evening). 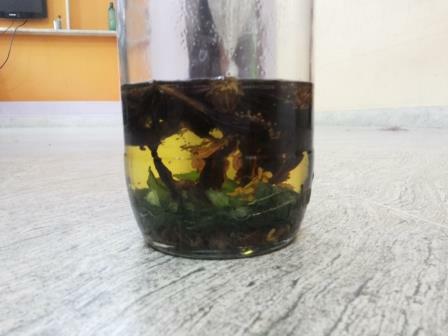 Take about 500 ml of coconut oil (in liquid form) in a glass jar (very important) and put about 10-15 dry Amla pieces, a handful of dried curry leaves, about 10 dry Hibiscus flowers and a reasonably sized piece of the dried Aloe Vera gel + Fenugreek seeds. Now, place this glass jar in sun light for about 5 – 7 days – every day in bright sunlight. After that you can use the oil to oil your hair, either everyday or every other day. No need to shampoo the hair. Just separate about 100 ml of the oil to a different bottle for everyday use and let the rest of the oil be with the dried herbs. You can also add one more batch of 500 ml coconut oil to this bottle before you throw away the herbs in it and start afresh. You can leave in this oil in your hair if you don’t feel your hair is too greasy (in other words, use sparingly; concentrate on the roots). Take a WOK or a deep fry pan and pour about 200 ml of coconut oil. Keep the flame low and add about 5 pieces of dried Amla, 5 dry Hibiscus flowers, one strand of dried curry leaves and the little of the dried Aloe Vera gel + Fenugreek seeds. The oil will change color; remove the pan from heat before the Amla pieces turn black. Let the mixture cool. Filter the oil with a coarse filter. 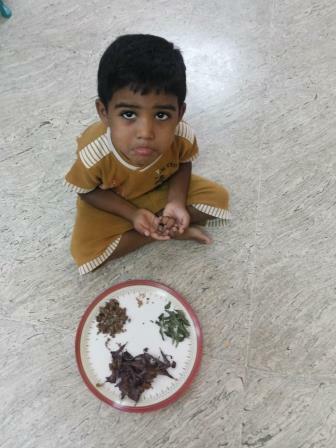 There will be quite some oil hiding inside the curry leaves and the hibiscus flowers. Just crush them with your fingers against the filter and you should be able to collect a few more precious drops. Keep this oil in a separate container (glass or plastic) and use once a week pre-poo. This oil is concentrated and has some odor (though I find it nice). So you have to wash your hair with shampoo after you apply this. And don’t use this more than once a week since this is a much more concentrated form. This oil can be used for massage; make sure you leave the oil for about 1-2 hrs on your scalp/hair before you wash it off. 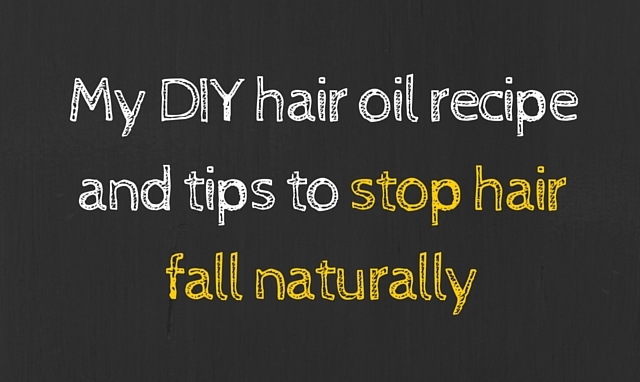 Stop hair fall naturally using these DIY tips! And these are my handy DIY tips to help you stop hair fall naturally. I’m almost against using chemicals for the most part (except when it is absolutely unavoidable or at times when I am lazy). I prefer natural remedies. Hope you liked these tips. Put them to use and let me know (in the comments) how it goes! Thanks for this informative and helpful article. I have been suffering hair fall problem from years and tried lots of medications but failed. But now i will definitely tries those natural remedies and make sure I don’t leave any chances to get relives from it. And I believe and hope it will works for me at last. I am looking for something different. I guess it is true that what you take in is essential not only to your hair, but everything in general.